While breakfast is the most important meal of the day, the usual choices we succumb to are pretty stale. Oatmeal and grits, pancakes and waffles, sausage and bacon ... yawn. But here's an idea: the fruit and cheese combo isn't just for party platters. Try spicing up your morning meals with this twist on a Mexican-style favorite. 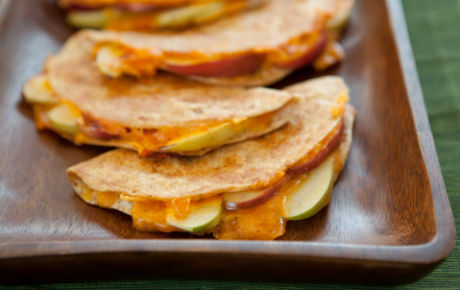 The appropriately named "Apple Jack" quesadillas are a healthy favorite to add to your new arsenal of quick breakfast creations. Preheat a teaspoon of the extra-virgin olive oil in a nonstick skillet over medium heat. Spread 1 tablespoon of pepper jelly on a tortilla and place it in the pan, jelly side up. Cover half the tortilla with about 1/2 cup cheese and 1/4 of the apple slices. Fold the naked half of the tortilla over and cook for a couple of minutes on each side until the quesadilla is brown and crispy and the cheese is melted. Keep in the oven while you make three additional quesadillas. Cut each quesadilla into four wedges and serve. 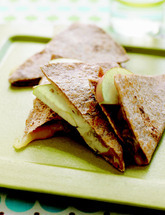 To freshen up the recipe, use different types of cheeses and apples! Recipe excerpted from Yum-O! The Family Cookbook by Rachael Ray, posted on seventeen.com.